Good to know: Summit Entertainment, the studio that made the Twilight - movies, have bought the movierights to the trilogy. Book 3 is apparently being released some time in 2013. 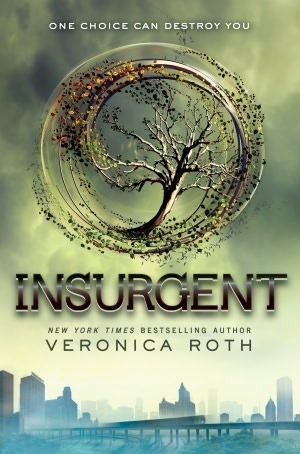 I have been waiting a long time for the sequel to Divergent, one of my favorite books of 2011. I preordered the book as soon as I could, but I did not have time to wait for the book arriving in the mail, so I also bought the kindle - edition of the book. I can now state that Insurgent also is a great read. The story in Insurgent picks up where Divergent ended. There are more things on stake for Tris, and she must fight for her own life as well for the lives of the people she believe in and love. Someone has the need to find out what secrets the Divergents hide in their brains, conflicts are brewing and people must choose sides. There are some surprising revelations, and Tris begins to question the meaning of the faction - system. I read somewhere, once, that crying defies scientific explanation. Tears are only meant to lubricate the eyes. There is no real reason for tear glands to overproduce tears at the behest of emotion. I think we cry to release the animal parts of us without losing our humanity. Because inside me is a beast that snarls, and growls, and strains toward freedom, toward Tobias and, above all, toward life. Insurgent is, as Divergent was, a real pageturner. There is not a dull section in the book. I was thrown from page to page, reading about suspense and dramatic events. I also like the fact that we get to know all the characters and the releationships between them even better in this book. I specifically like how the author spends time developing the relationship between Four and Tris. She does that very believeable, without use of cliches. Tris has a great development. There are a lot of great character-descriptions in the book, much more so than in Divergent. That is a natural thing. In bok 1 there is a need to set the story and the plot, to show the reader the characters. In bok 2, the author may dive deeper into the people on the pages and the story. The language is also good, not one sentence appears to be in vain. Everything is so perfectly built up. There are also a lot of nice quotes. Grief is not as heavy as guilt, but it takes more away from you. The last part of the book is so suspenseful, and the ending just wants me to grab the third book rightaway. How will I be able to wait until 2013 to know what happens??? I still believe that this series will be the next Hunger Games. The books have everything: suspense, romance, mystery, dramatic events, great characters etc. I love Roth's worldbuilding in the books, the thought behind every faction and the way they are described. If you have read Divergent, you can really look forward to this book. If not, you need to read Divergent right now! This is an awesome series! I finished off Divergent this week and today a friend sent kindle version of Insurgent as a gift. I want to wait a bit before I jump in but I don't know how long will I be able to do that?! ?